In the knowledge society, there is no end to the amount of information we have access to. Unfortunately, in a training and instruction, content overload can significantly reduce student learning. 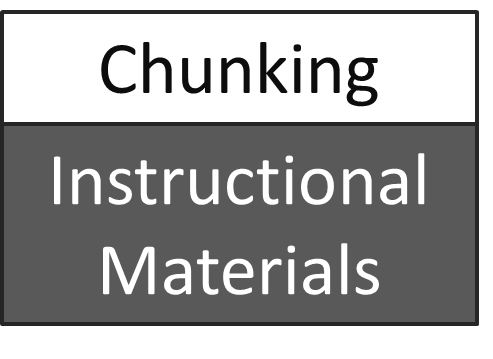 This is why many people recommend chunking instructional materials - this means breaking the training content into appropriate "chunks" or pieces so that they can be more easily processed by the learner. In this blog post, I explain the benefits of chunking instructional materials and describe how to do it effectively. Manages cognitive load - our minds have limited information-processing ability, so we have to process it in relatively small pieces. Helps students stay motivated -if students become overwhelmed with the amount of information they receive, they often have a decrease in motivation. Helps learners organize knowledge - when we break information into logical pieces, the learners can see how the information is organized and can therefore mentally organize it more easily. Helps instructional designers stay organized and redesign more easily - when instructional materials are organized and chunked logically, it is easier for the designer to find, revise, and improve them. 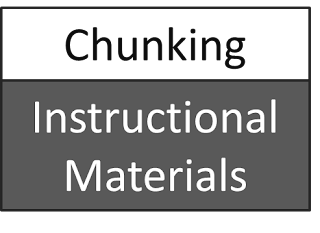 What are the best strategies for chunking instructional materials? Based on my experience and research, here are some basic strategies that can really increased the effectiveness of your instruction. use headings for different sections of the text to help students organize their thinking. use bullet points to summarize and clarify important points. use tables to summarize large amounts of data. break things up with images that illustrate what is being taught. summarize the content at the beginning and at the end of the text. use italics and bold important words. Use LOTS AND LOTS of emoticons. :) Just kidding. Break your course materials into logical, meaningful pieces and structures. This can be done according to weeks, modules, topics, or projects, depending on the content and the situation. Break each module up according to types of activities (reading, watching, discussing, sharing, applying, etc.) This helps students see what they will be doing with each piece of content. It makes sense to use the same sequence and structure for each module so that students know what to expect. It should be noted organizing instructional materials should follow known instructional strategies. For example, the conventional strategy of Tell, Show, and Do can be used by having students Read, Watch, and Apply. If working with video, be sure to break things up by using smaller videos that are focused on specific pieces of content. Small videos will not distract as much as longer ones* do. *Note that video length does not apply to the original Karate Kid movie. An epic classic. Some of the same advice for videos applies for chunking in e-learning. Keep the time spent on each slide or screen relatively short and targeted. Follow a sequence of activities that matches instructional theory. In addition, make sure that the information on each slide is well-organized and focused. Include only what is necessary to convey the knowledge you desire and eliminate any distracting or unimportant information or images. Hopefully these suggestions are helpful to you. And while these have worked really well for me, in the end, you need to follow what makes the most sense based on your goals and your situation. Design is heavily based on the context in which the work is done, so adapt these strategies to your own situation. I am interested to read of any other recommendations for chunking materials effectively - please comment!